The endgame is at hand for Penn Cage, his family, and the enemies bent on destroying them in this revelatory volume in the epic trilogy set in modern-day Natchez, Mississippi—Greg Iles’s epic tale of love and honor, hatred and revenge that explores how the sins of the past continue to haunt the present. It's not "muddy water", it's "bloody water". This is a fantastic read, the third book in a fantastic Trilogy written about life, as vicious as it used to be, in the deep south. Hate, love, murder, and any other emotion you can pull, are touched upon in this book. A great read and I know I will be re-reading this entire trilogy many times over. Read all of his books. His detail to the history of the south, his characters are brought to life so well, that I could visualize them. I never want to put the book down, but never want to finish. Best one of the trilogy! Hands down.... this is my favourite in the Natchez trilogy. The trial of Penn Cage's father, Dr. Tom Cage, was so interesting to read. Greg Iles, in my opinion, is a great story-teller and I find his stories completely engrossing. IF you haven't read any of Greg's books, do yourself a favour and get one; any one is a great read, and I've read about 9 or 10 myself. 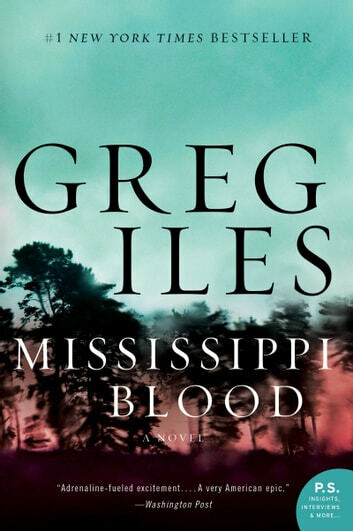 Greg Iles once again brings Mississippi and his characters to life. I have enjoyed all of his novels and hope another Penn Cage story will be coming soon.